This is the BEST and Most Anointed Children's DVD out there that I have seen to send the message of Christ to all ages! Geared towards children, this is a recorded video of a live Psalty Show! 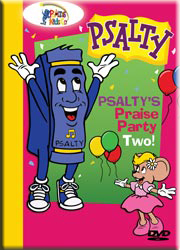 Psalty takes the kids on a fun-filled, singing adventure on his amazing Time Machine with Charity Churchmouse and the Nose-It-All. An interactive show that will lead kids to Christ!